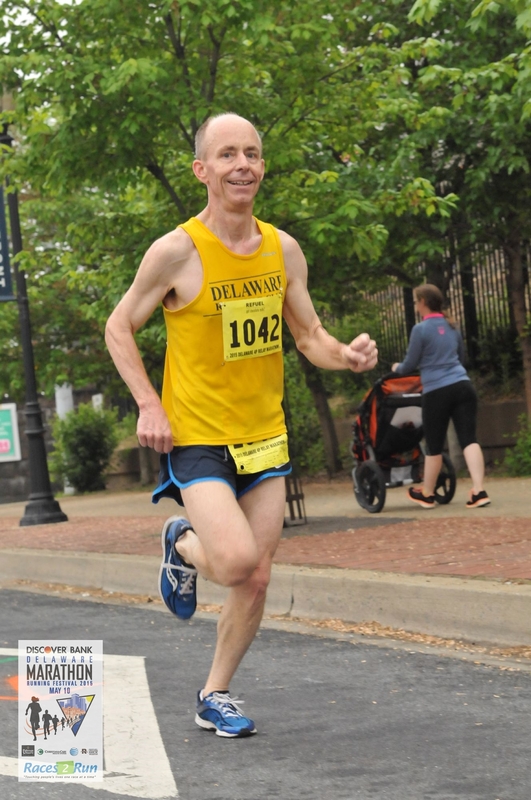 Creek Road Runners always show up for and show well in the Delaware Marathon relay. Last weekend’s race was no exception. Led by CRR Bill Rose, who ran a blazing fast 43:46 initial 6.55-mile leg, the 2015 edition of the Creek Road Runners team finished 8th overall out of 132 teams in the Refuel with Chocolate Milk 4 Person Relay. This was also good for a coed senior division win. The team’s total time was 3:11:47. Leg two was carried by CRR Christina Parsons (52:48), who three weeks earlier had run a PR in the Boston Marathon. A last-minute substitute for an injured CRR Mark Deshon, triathlete and CRR Steve Tague turned in a 49:16. Back in racing form again, CRR Bill Farquhar brought it all home with a strong 45:55. In the half-marathon, CRR Natalie Rosenberg finished 68th overall (out of 1,159) in 1:41:50, placing 4th in her age group (25-29). CRR Dave Schultz just squeaked under two hours with a 1:59:37. Wife CRR Christine Schultz came in a few minutes later at 2:05:52. Three hundred thirteen runners finished the Blue Hen Homecoming 5K last Friday at the University of Delaware Athletic Complex. 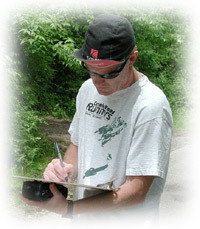 Of those, four Creek Road Runners took home awards in special categories. CRR Bill Rose (pictured) hasn’t lost a step in a few years now and proved that again with a third place overall finish in 19:22. 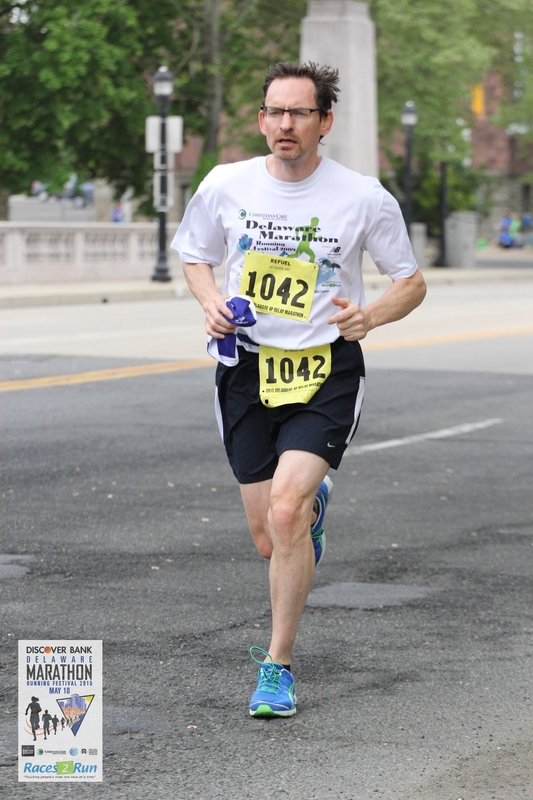 Finishing first in the “UD Employee/Retiree” class, business school dean and CRR Bruce Weber posted a 20:36, coming in 7th overall. Not bad for his first of two weekend races. Taking third in the same class with a 20:50 was CRR Steve Tague, coming in 10th overall. CRR Diane Kukich took third among the females in that same class in 26:26. She would have also won her ten-year age group (60-69). CRR Mark Deshon finished 14th overall but was 2nd among the “Alumni” runners in 21:07. Had there been a 50-59 age group, Rose and Weber would have placed 1st and 2nd, Tague and Deshon, 4th and 5th, respectively. Speaking of “what if’s,” CRR Bob Taggart (26:34) and CRR Paul Amer (30:31) would have won the 70-and-over and 60-69 age groups, respectively. Nice job, guys. A special shout-out to CRR Nick Sisofo, who made a rare appearance on campus with a 26:54. Thanks to CRR Kathy Corbitt and her HealthyU Employee Wellness staff for organizing a fun event around Homecoming Weekend. After several years effectively out of competition due to medical issues (including one serious bike accident), CRR Steve Tague is unequivocally back! 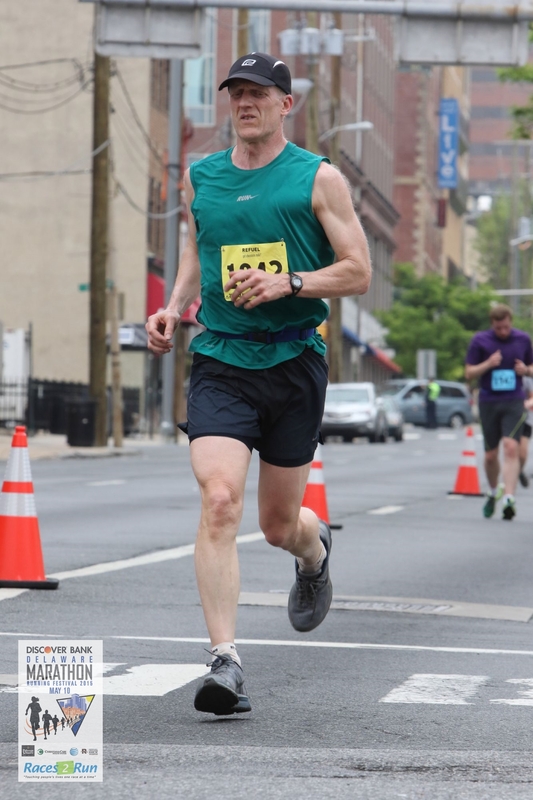 Yesterday, he led the way for the other eight Creek Road Runners at the Top of Delaware Sprint Triathlon, placing 14th overall out of 271 finishers. He won the men’s 55-59 age group in 1:04:54, placing 17th in the quarter-mile swim, 12th in the 11.4-mile bike (averaging just over 20 mph on the hilly course! ), and 32nd in the 2.6-mile run at the Newark Reservoir and Mayor Redd Park trails, which includes a final 30-yard incline straight up the side of the reservoir hill (that’s serious theater). CRR Rich Braun was the second of the fold to finish, placing 63rd overall in 1:15:41 on the basis of a strong bike leg (17th). 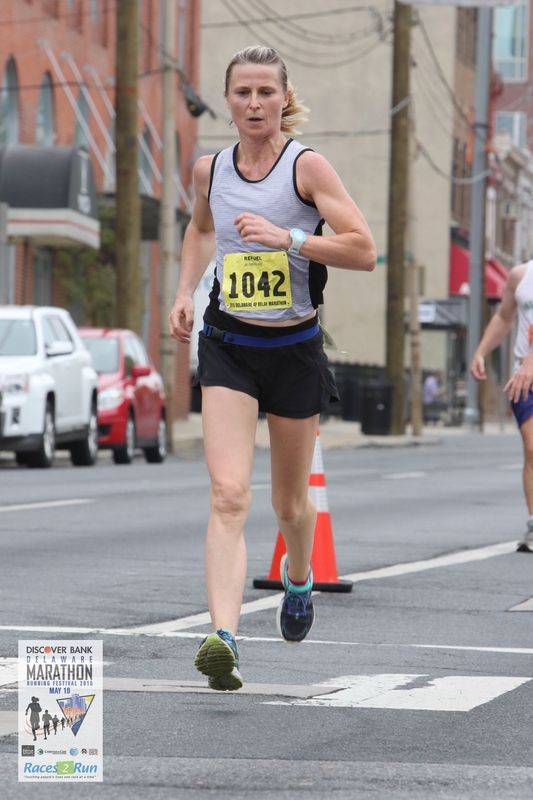 Three other Creek Road Runners took age-group awards on the day—CRR Dan Simmons, coming off an injury to win the 65-69s in 1:16:12, placing 65th; CRR Theresa Kauffman, who took second among the 50-54s in 1:19:46, placing 90th; and CRR Sue Barton, who took second in the 55-59s, rounding out the top 100 finishers in 1:20:38. Other Creek Road Runners who finished were CRR Ryan German (1:21:38), CRR Jen Pyle (1:25:12), CRR Mary Braun (1:31:58), and CRR Bruce Hubbard (1:39:00), who deserves a big shout out for being the only one of the nine to have indicated “Creek Road Runners” as his registered team. Take a hint, everyone. Soon, nothing should be standing in the way of training time for three Creek Road Runners. The University of Delaware Board of Trustees approved the promotions of CRR Bill Farquhar (kinesiology and applied physiology), CRR Mike Shay (physics and astronomy) and CRR Steve Tague (theatre) to full professor beginning in September. They all have tenure on Creek Road. Creek Road Runners join in congratulating them on this career achievement. Two age-group wins were recorded by Creek Road Runners at the annual Icicle Ten Miler in Wilmington on January 12. CRR Jay Coughenour simply melted the difficult ten-mile course in 59:06, finishing 4th overall and winning the 45-49 age group. Dover’s CRR Holly Scott took the 50-54 age group with a 1:16:21. CRR Dan Simmons managed a 2nd place among the 65-69s in 1:13:42. Other finishers included CRR Steve Tague (1:15:34), CRR Tripp Shenton (1:20:06), CRR Theresa Cannon (1:24:54), and CRR Bruce Hubbard (1:37:30).